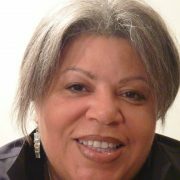 Sheila Elaine Anderson-The Queen of Hang, host on WBGO, author, MC, concert producer, TV show producer-started out in jazz as a volunteer at WBGO, sometimes helping the late Harvey Wise clean up the studios. Music has always been part of my life. I grew up in Buffalo-my father’s family has been in Buffalo since 1836, one of the oldest black families there. His eldest brother, my Uncle Jimmy, was a jazz musician, a bass player, although he gave it up professionally after he got married and started having kids. Once he retired he resumed playing the bass. I’d heard that Stuff Smith wanted to take him on the road-he was that good-but Uncle Jimmy was only 17 years old at that time and his parents-my grandparents-wouldn’t give him permission to go. He got married a year later. My father’s cousin Jerry played piano, and he’d come over and show all us kids things on the piano, give us a quarter to play with him. He was a great fellow, fun to be around. We had a big console record player in the house when I was growing up, and because we only had the one record player we all had to listen to everybody’s music. We set aside time in the week for each of us to play what we liked. We each had different musical tastes. My mother, for instance, liked classical music and opera. Sunday was her day to play her music. My oldest brother “Chips,” who passed away in 1976, had an incredible jazz record collection. I remember when I was about six years old listening to his copy of Miles Davis’s ESP and Richard “Groove” Holmes’ Soul Message. I’d go and take the records from the shelf, they were my favorite records, but if I held them wrong, my brother would take them away and I wouldn’t be allowed to listen to them for awhile. So I always gravitated to jazz. We all had to go to music school too. I learned the flute, and at one point I considered making music my career. I also wanted to be a bilingual psychiatrist in New York City! People used to say I was the psychiatrist in the family. Everybody could talk to me, I was the reasonable one. But once I took biology, I knew medical school would not work out for me. Whatever it was that I would end up doing, I knew that it wouldn’t be a traditional career. Early on, people would ask me what I wanted to do or be, and I would say, “I just want to run my mouth.” I loved going to parties, being around people, listening to them, talking to them. Even as a kid I enjoyed adult parties, loved the conversations, just being around interesting people. That has been a constant in my life to this day. Volunteerism was important in my family and in a way it has helped me find my career and brought me to where I am now. I was secretary of the Youth Group at the Episcopal Church (we were Catholic but my friends all went to that church so I hung out with them and ended up getting elected) and, at my mother’s prodding, I got involved in the NAACP youth organization too. I was local president, state youth president, and in four years I was on the national board. It was my mother urging me on that made me do that-I started in the summer when I was really just ready to play, but she was a teacher and insisted that I do something educational with my time; and as I got more involved my father helped me out with my speeches and encouraged me to run for state youth president. That was a time! They were flying me around the country, and I was going to all these conventions, speaking, and at 16 years old! I am not afraid to put myself out there, not afraid of rejection, never was. Looking back, it was during this period when, if I was going to be serious enough about the flute to be a professional musician, I should have been working on the music; instead I put all that energy into the NAACP youth organizations and getting elected-I was trying to keep my grades up too! But I didn’t want to be in politics as a way of life; I didn’t want my livelihood to depend on sucking up to people. I’d just seen too much compromise and I wasn’t willing to do that-maybe I’d do it if I was independently wealthy. I thought about some different things but one idea I had back then would turn out to be very important to my life much later: I signed up for a course in radio announcing. It was just a few-week-long course for independent radio and I got to do a 15-minute show at the end of it that I think was on in Elmira at two in the morning. This so-called course wasn’t real training but it was something. I had in the back of my mind that I might do talk radio one day. So I listened to a lot of talk radio to hear how they did that and how they spoke. But nothing came of it then. I moved to New York in 1980 with my unemployment check from a job that had ended in Buffalo. A guy had offered me a job at his ad agency but it turned out not to be what he’d said it was. So the unemployment check was all I had. Then I got a job as a cashier at Carmichael’s Diner, a local black institution in Queens. I was about 20 years old, all dressed up in my business suits at this diner, I must have looked like an alien. But King Carmichael, the owner, instituted jam sessions there on Wednesdays, and I would come in with my flute but as it turned out I never actually got up and played it. Different people came down for the jazz sessions. That’s where I met Bill Saxton and some other people. I had planned to be in New York for five years, finish my degree in marketing at Baruch College and go home to Buffalo; I didn’t even like New York at first. It was too much. But the degree took longer than I’d thought it would and I got a job in the production end of book publishing to support myself and looked to volunteer somewhere. I tried Jazz at Lincoln Center but they didn’t have a volunteer organization yet; and I was encouraged to go over to the philharmonic because they were set up for volunteers. So I tried that, but I was the only black volunteer besides the president of the volunteers and people couldn’t tell us apart even though we were completely different. And some people said ignorant things-one woman asked me what my name was; when I told her, she said, “Oh, you’ll have to change your name?” “Why is that?” “We already have a Marian Anderson…(the famous black classical singer).” You know, things like that. I had called WBGO, the biggest jazz station in the country, based in Newark, New Jersey, during a fundraiser to make a pledge and they asked me if I wanted to volunteer. I said, “Sure.” It took a while, but a few months later, I got a call and I went over to the station. It is easy to get to from Manhattan I just got on the train and there I was. I started there as a volunteer, working their phones during fundraising and whatever else came up, in 1987. I met a lot of cool people, and I remember saying to myself, “Now, this is FUN!” One person I met, Harvey Wise, was both a volunteer and had a job at the station cleaning up at night. He and I got to be friends, we were friends for many years-he’s dead now, God rest his soul. At some point early on, I said, “Harvey, I’ll help you clean. I need the money and I like being here.” At first he kept saying he didn’t need the help, but he finally let me do it. So then I was pretty much always around WBGO after work and I got to know the DJ’s, people like James Browne, who did the evening show, because we were always there at night cleaning up. I often rode the train home at night with Ben Duncan, one of the announcers. One night I told him, “You know, I would like to do radio.” He was so encouraging. He said, “Well, you should! We need more women” and this and that and he got me all excited about it and then I started talking to other people and they encouraged me. It was during one of the fund drives that I went to Gary Walker, the music director, and said, “Ben suggested that I talk to you about being on the air.” Well, Gary said I had to talk to Thurston Briscoe, the new program director. He was pretty new then, so he said, you’ll have to talk to Alfredo Cruz, the head of production. I was persistent. My mother taught me that. Don’t give up. So I made an appointment with Alfredo and he just waved at the board and said, this does this, this does that, this does whatever else it was, and he left me with it to learn on my own. I don’t have any idea what made me think I could be an announcer. I had no training, no nothing. But because I was there cleaning up with Harvey, I was around the station a lot and after about a year and a half I could do the board enough to try it live. Each announcer was his own engineer so I had to know how to work the board before I could think about going on the air. At that time it was pretty loose at night at the station so James Browne let me come in and engineer his show a couple of times kind of informally; he didn’t exactly ask anyone about me doing it. I learned a lot from James, although he would put me through…waiting till the very last minute to tell me what he was going to play, for example. At the same time, my friend Harvey was helping me with my jazz education. His knowledge of music was amazing. He would make me tapes, and do the same thing my brother used to do to me-make me listen and say, “Well, who is this? Ok, break it down. Start with the instrument, what is it? Ok, what kind of saxophone? If it’s John Coltrane, then who’s in the band? Think about it. Think about it.” That was torture in some ways, but it was unbelievably good for me. Harvey would say, “Look, you can identify singers. But if you listen, you can identify horn players, bass players, all the instrumentalists in the same way. They’ve all got their own sound.” After about a year of that, we were listening to something and I said who it was and he smiled and said, “Yeah.” I got it. Harvey bought a car at some point and we’d hang out, go to jazz clubs all the time. He had this deep voice and he’d call me and say, “Babe, I need some music therapy. ” He had great taste, so we’d go out and always hear something good. I got a lot of education from him, but there was a gap-I’d gotten into disco for a while, so there was a gap in my jazz education. I didn’t know enough, really, to have a show on the radio at that point even though I thought I did. I just figured that if I could do the board, I could do a show. That was my mother’s doing; she always said never to assume that I couldn’t do something. Always figure I CAN do it, then learn. I had noticed that the one time slot with a big turnover at WBGO was the Sunday morning show. There was always an opening there for a host. So I asked Thurston to consider me for that slot. I gave him my tape-James Browne and one of the engineers had helped make it-which was done on a reel-to-reel machine with edits and splices by hand, that was back in the day! I realize now that my tape wasn’t very good. But when Thurston was kind of dismissive about it then, I was offended. I was that crazy. But I didn’t say anything and I didn’t see Thurston for quite a while after that. I did keep letting people know that I thought I could do the job, that I knew the music, I knew the board, this and that. Still, I was turning 38 and I had told myself that I would move back to Buffalo when I turned 40; I was about to get married and move back to Buffalo when Awilda Rivera called and invited me to a going-away party at the station for Alfredo Cruz. I was already going to a publishing party that night in New York but I thought I’d do both! Thurston actually asked to speak to me that night. This is how my life is. I don’t plan things, but my path just opens up for me. So Thurston said, “What do you know about piano and guitar?” “I know a fair amount,” I bragged, but in fact I did not know a goddam thing. That was my mother’s voice inside of me again, telling me not admit I didn’t know something-to just say yes and then learn it! Thurston remembered that tape I’d given him and that was great. He was preparing to move some people around: Awilda was doing Sunday Morning Harmony but she was the only one who could step into Alfredo’s Latin Jazz Cruise spot. So Sunday Morning Harmony was available again. “I know you’re getting married and leaving soon,” he said, “but maybe you can do the show temporarily. Make me another tape.” Well, I didn’t hear the word “temporarily” or anything like that. I just heard that I’d got the show. I got the show! Now, two things: first off, it was Harvey who should have gotten the show. He really knew the music and had this great voice. People were begging him to go for it. But he wouldn’t try. When I was beginning to learn the board, I’d tell him, “Harvey, you should be in here doing this. You know so much more than I do and they want to help YOU. I’m just imposing myself.” But he was afraid of both success and failure, caught on the horns of that dilemma. He drove me home after Thurston offered me the show and I told him, he was hurt. And he was angry for quite a while. The second thing is that my announcing was still no good. Thurston listened to that second tape and said he couldn’t put me on the air with my sad announcing skills. “Your announcing is horrible. It’s just not happening,” was the verdict. I went on a mission. I came into the station on public transportation from New York three nights a week, went right into the library and pulled every piano/guitar CD or album we had. Folks were giving me stuff to listen to on top of that. I listened to everything, made notes, and practiced the announcing part. I talked to people, practicing. This was a month of constant constant work, I used up reams of paper with my notes about what I liked and what I didn’t like. Then I’d do the announcing and let other people hear what I said. I made another tape. Finally, Thurston said, “Ok, I can put you on the air now. February 14, 1995, I did my first show. It was the overnight show. Then I had every other Sunday alternating with Jim Luce. After a few months of that I had the show to myself. It took me two years to get comfortable announcing. People would complain about me; they’d call up and say they liked the music I played but couldn’t stand my announcing. People would complain to my face and that made me more nervous. I took so much abuse. Every week I thought was going to be my last week. But I did work hard at improving. People would say, bring in pictures of people you like and talk to them when you’re speaking into the microphone, trying to be helpful. So I pretty much taught myself. Thurston brought in a voice coach for all the announcers about two years after I started on the air and she was a tremendous help-raised my announcing to another level. The fact is, I’m still learning. Here’s how I ended up hanging out in jazz clubs by myself and getting known as the Queen of Hang. I got involved with Time Warner’s Manhattan Cable Network around 1994, before I even got settled into Sunday Morning Harmony. They had advertised, “If you want to be a TV producer, call us…” you remember. You got some training and they gave you a public access TV show. So I had an idea of interviewing my friends in a relaxed setting and having intelligent, lively, interesting conversations for radio or TV or something, but that idea never worked out. I imagined it would be like one of my dinner parties, and I do love talking to people, but I just couldn’t figure out how to do that. I still had that in mind when I started doing Sunday Morning Harmony and asked Thurston if I could interview musicians and talk about music with them. I wanted to learn about jazz from the musicians’ mouths in that same relaxed way. He said no. So I used my TV certification from MNN to create my show, “The Art of Jazz,” and I brought groups-there was no piano in the studio-up and filmed them in half-hour segments. But I had to meet the musicians to ask them if they wanted to do that. It didn’t pay, it was public access. I decided to go to Bradley’s because I’d heard that was the best place to meet the musicians. I hadn’t been there more than once or twice. Harvey didn’t want to go and I couldn’t get anyone else to come with me. So I went by myself and after the first time I realized this would be fine. The bartender and I got along and I introduced myself, first of all, to Ray Drummond. “Hi, I’m Sheila Anderson and I do a Sunday morning show on WBGO. I have a TV show. You want to be on it?” I expected him to say no. He said “Yeah!” So that was that. I asked Kenny Washington, who I knew from the station, Peter (Leitch, the writer’s husband) did two. Eric Reed came on, Ron Carter, a lot of people. I ran about 60 shows. I haven’t made any new ones for a few years; now I’m just trying to transfer them onto DVDs from VHS. Hanging at the bar was just the best way to learn about this music. I learned right from the musicians sitting at the bar talking among themselves about the music. Someone says, “Aw, he don’t know the changes.” I say, “What does that mean?” Or “So and so is sad. They’re dragging.” I needed to learn what all those terms meant. I asked a lot of questions, met the musicians, got them to come on my TV show, and it just escalated from there. I didn’t just hang at Bradley’s of course. Here’s my typical Monday schedule during that period: I would get off work (I was still doing publishing production ), go to the weekly jam session at the Musician’s Union, then went up to Wells’ to hear the Harlem Renaissance, then up to St. Nick’s Pub to hear that jam session, before going home. Other nights I went downtown to Zinno’s, the Vanguard, and over to Sweet Basil or Bradley’s, sometimes all in one night. I knew where everybody was playing and I always sat at the bar. That’s how you get to know people-at the bar, you could still smoke in those days, everybody was hanging out. One time, after I had bought my car, I was in the car listening to WBGO and I heard Michael Bourne saying that at such-and-such club was so-and-so. He was wrong. I called him up and said, “No, Michael, it’s so-and-so at that club. So a minute later, I heard him on the air. “I misspoke. I just got a call from Sheila Anderson, the Queen of Hang. She knows everything…” That was how I got my moniker. I treat everything like a job and I do my best. All the things I have done in jazz, whether volunteer or paid, have ended up working for each other. I started introducing bands up at Grant’s Tomb every Wednesday because I wanted to learn how to Emcee. Ben Duncan at WBGO had been doing that task and suggested I take it over. I asked Jonnie Garry, who runs the program for Jazzmobile, if I could emcee for him and he said sure. So that was how I learned, by doing it. I got to meet more musicians, learn how some musicians want the emcee to get up before the last song and introduce the band, some want you to come up after or do something else. I was so bad at first, Jonnie kept trying to coach me. “Baby, you got to do this. You got to…” Well, after a few months, he was satisfied and he had no more complaints. I did that for eight years every week and still sometimes do it. Years later, when I was on staff at the Newark Museum, and produced a big Martin Luther King Day program, I used that experience I had gained up at Grant’s Tomb to run my program there. Publishing jobs, working at the Newark Museum, some other projects, were all important to help ends meet, because being on public radio once a week is not that profitable. At one point, I think it was in the mid 90s, I was asked if I wanted to be the regular overnight host at WBGO but I could not make it work financially. In early 2001, my money ran out. I had lost my day job, had a car accident, and almost everything else that paid had dried up. I recall taping Eric Reed for my TV show and thinking about having a fast food lunch, something cheap. Eric said, “Sheila, that is the wrong thing to do. I don’t think you should have a bad lunch.” He was right, as broke as I was, I treated myself to some good food and when I got home I had a phone call about a good temporary job that went almost a year and was the catalyst to me getting my first book deal. Of course I didn’t know how to write a book proposal. I researched that, I had to find sample quotes in a hurry. Our managing editor at Lyons stepped in and helped me put something professional together, and on November 4th, 2001, I got the word that they wanted to do it. “Come in and talk. We like your proposal; we don’t like the title.” I went in to “talk” and they already had contract and a check waiting for me! This would be the second book in a new series for Allworth, so they flat out said they couldn’t help me with the format of it because they were still working on the first one. When could I have a completed manuscript to them by? I picked my birthday, June 12, out of the air: I was just amazed-I got money to do a book! I went right to work on it and asked all the musicians I knew for quotes–you remember, I asked Peter (the writer’s husband) for a quote; Eric Reed helped me, Jeff Clayton, all my friends. I wanted a good part of the quotes to be current. I also wanted the book to tell a story so that people could get some context of the quotes. This turned out to be an amazing project. I was still doing Sunday Morning Harmony on WBGO (I did that for nine and a half years) and consulting for the Newark Museum in their education department. Again I was lucky. The Newark Museum asked me to be on staff while I was writing the book and offered me a four-day schedule so I could finish my manuscript. That was great! I was totally consumed with my projects for that whole crazy year. Eventually I began working full-time at the Newark Museum and produced their concert series. I’m very proud that I was able to make that series into something that people wanted to go to: We went from 200 people a week to 600-800 people coming every week. That caught the attention of some other people who have asked me to produce their concert series too. Everything is connected in my life that way. My second book for Allworth, four years later, was essentially an interview book: How to Grow as a Musician: What All Musicians Must Know to Succeed. Some of the people I talked to were Oscar Brown, Jr., the late Ruth Brown, Al Jarreau, Dr. Billy Taylor, Michael Wolff and Eric Reed. I had a great time with that one also. These days, I’m still doing some consulting for the Newark Museum, have a new book coming out this fall, producing some, writing some articles, working on bringing my TV show tapes into the DVD format and thinking of taping some new shows, and, of course, I’m still at WBGO. That is the constant in my life. After doing Sunday Morning Harmony for nine and a half years, I did Saturday Night Late Night Jazz for three, and currently I’m doing weekend overnights.